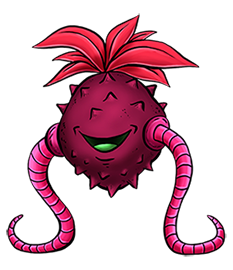 This jovial plant monster is designed for low altitude air-to-surface strikes and infantry support. It uses its tentacles to launch itself into the air, spinning its leaves like a helicopter to achieve flight. From there, it can spit seeds at a rate of 10 rounds per second; these seeds are hollow, which causes them to burst inside the target, inflicting terrible damage. The spines covering its shell are actually sensors which give it a nearly 360 degree view of its surroundings, with its only blind spot being directly above it.